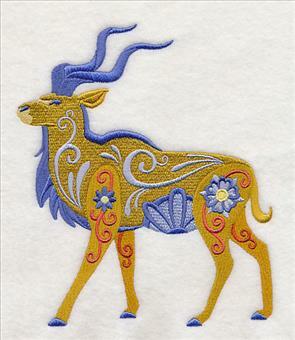 Embroiderers have the best ideas for new designs! 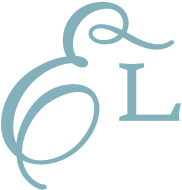 Our inboxes overflow with creative suggestions from you, and reading your requests is truly a highlight of our day. 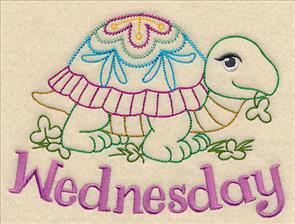 This week's new designs are all part of a fabulous Request-fest, meaning every new design is inspired by YOU! 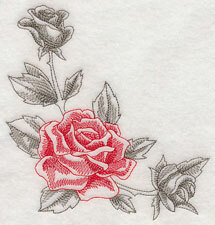 You send in the ideas, and we bring your idea to the drawing board and the embroidery machine. 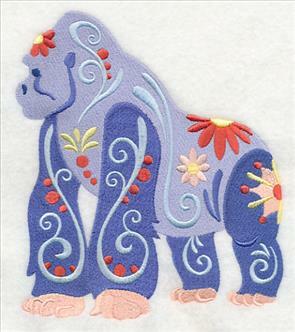 The variety is astounding: African animals in flower power-style, more toile birds in bloom, elegant chinaware-inspired designs, new clotheslines, and so much more! Scroll down to see these new designs! 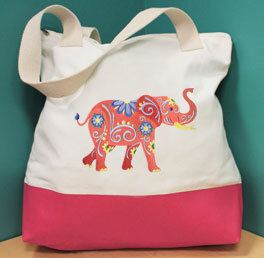 Update a classic canvas tote with a bright and vibrant flower power animal! Kathryn loved the first pack of Flower Power animals, and was hoping we'd create even more of the colorful, whimsical animals. 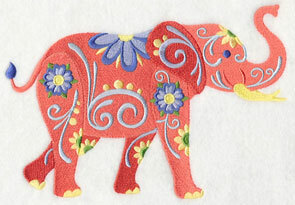 Here, a series of adorable African friends are adorned in the bright blooms. 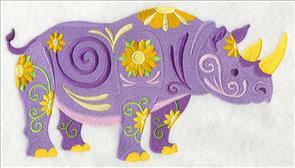 8.43" x 5.86" and 6.86" x 4.77" and 3.86" x 2.69"
Stitch a fun, playful rhino on a tote bag, or a bright and beautiful hippo on a pillow. 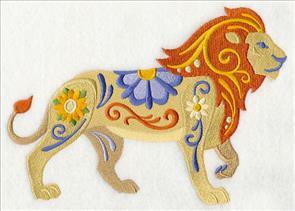 The colorful animals are terrific on a wide variety of projects, including apparel, towels, beach gear, and more! 9.40" x 4.50" and 6.86" x 3.28" and 3.86" x 1.85"
A flower power gorilla and kudu round out the rest of these African animals. 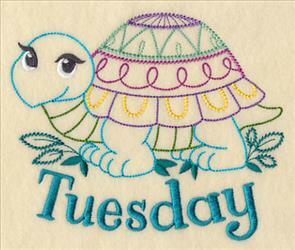 Pick your favorite from the bunch to embroider, or stitch them all! 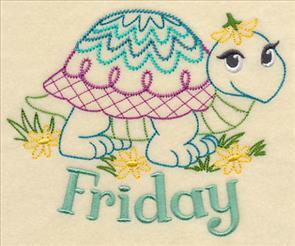 5.86" x 6.84" and 4.86" x 5.67" and 3.31" x 3.87"
Let these flower power pals frolic across your next embroidery project! 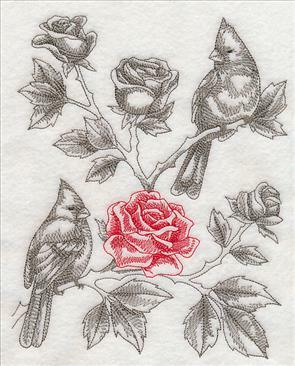 Monica was a big fan of the toile Birds in Bloom designs, and was longing for versions featuring cardinals and chickadees. We were happy to oblige! These light and airy toile designs feature the birds perching alongside beautiful flowers. 6.88" x 8.56" and 6.25" x 7.78" and 5.38" x 6.69" and 4.85" x 6.05"
Because toile designs are light and airy with open spaces showing, stitch them on smooth, low-nap fabrics for best results (like quilter's cotton, linen, denim, and canvas). 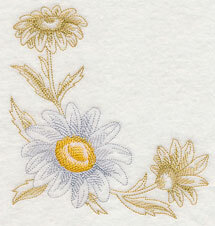 5.85" x 5.96" and 4.78" x 4.87"
7.80" x 2.54" and 6.00" x 2.19"
A pair of chickadees land amongst daisies in this elegant design. Chickadees are commonly associated with this type of flower thanks to the bird's love for daisies, and the pairing is often prevalent in artwork. 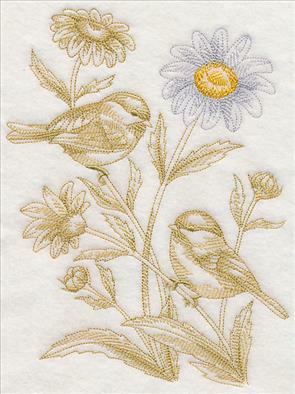 6.88" x 8.75" and 6.12" x 7.78" and 5.38" x 6.84" and 4.85" x 6.16"
Pair the toile chickadee and daisy design with a matching daisy border and corner. These designs feature one bright bloom against lighter, muted flowers. 7.80" x 2.75" and 6.00" x 2.29"
Carol requested more woodland circles like the Mallard Duck Scene and Great Horned Owl Scene, and our other wild bird scenes. 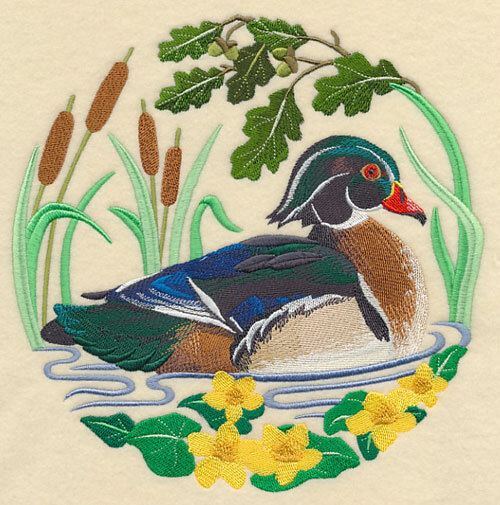 Here, we've stitched a gorgeous woodland duck surrounded by traditional greenery -- add the whole group to a quilt or series of wall hangings! 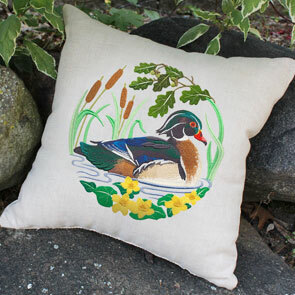 8.60" x 8.67" and 7.73" x 7.80" and 6.90" x 6.96" and 5.84" x 5.89" and 4.87" x 4.91"
These stunning woodland scenes are gorgeous additions to pillows and other embroidery projects. 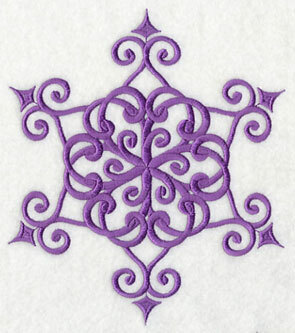 A light, blank fabric gives the embroidery design a beautiful place to shine. 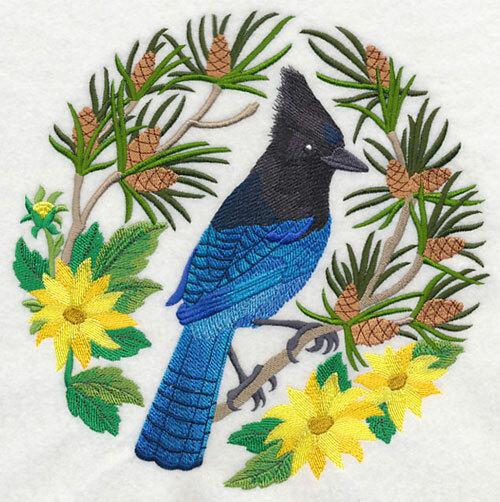 The Steller's jay is native to western North America, and closely resembles the blue jay. Here, the beautiful bird relaxes alongside blooming flowers and pinecones between flights. 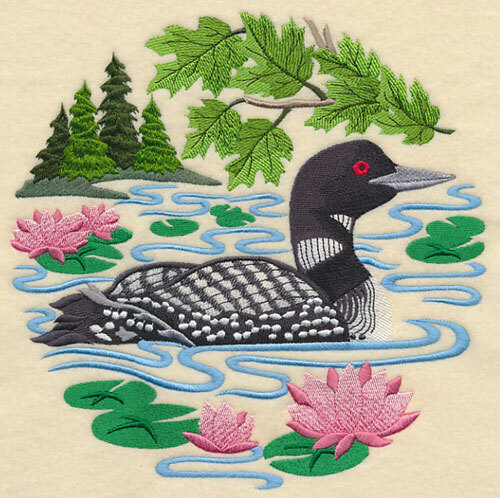 8.60" x 8.60" and 7.80" x 7.80" and 6.91" x 6.90" and 5.86" x 5.85" and 4.86" x 4.85"
Loons are the state bird of Minnesota, so we were especially excited to stitch this water bird! The serene scene is a fabulous addition to totes, framed pieces, and more. 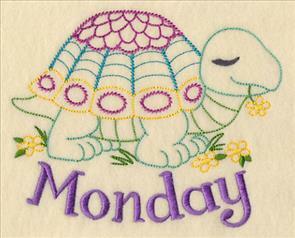 8.60" x 8.59" and 7.80" x 7.79" and 6.92" x 6.90" and 5.86" x 5.85" and 4.86" x 4.85"
Pat wanted to create a set of kitchen towels featuring days of the week turtles stitched in vintage style, and we thought the idea was too sweet! 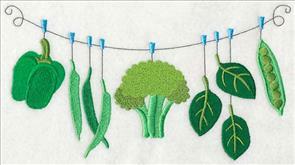 These quick-stitching designs are a fabulous way to update your kitchen in a flash. Thanks, Pat! 6.01" x 4.90" and 3.61" x 2.95"
Each design features bright colors and whimsical details to add color and flair to your kitchen decor. 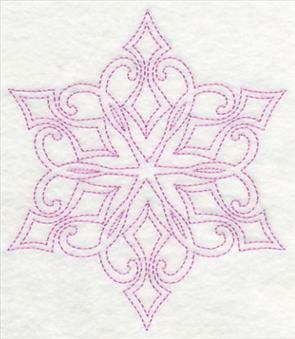 Plus, the text is a separate color stop, so you can omit it and add to other embroidery projects such as aprons, napkins, and placemats for a matching kitchen set. 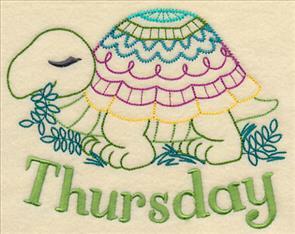 6.71" x 4.89" and 3.89" x 2.85"
The turtles featured on each design have varying details and colors in their shells, and are all paired with a different type of flower or plant. 6.03" x 4.90" and 3.62" x 2.96"
Because vintage-style designs are best on smooth, neutral fabrics, these Days of the Week designs are especially well-suited for tea towels. Try them on your next set! 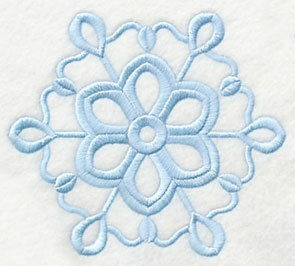 6.44" x 4.89" and 3.74" x 2.85"
Find quality towels at stores such as Kohl's, Home Goods, or Target. 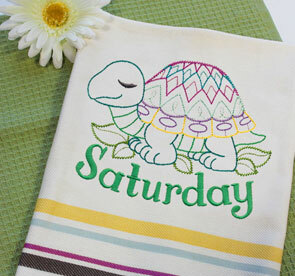 Add these too-cute turtles to your next set of tea towels for a fun burst of color. Clothesline designs featuring fresh fruits and vegetables were number one on Julia's list, and we couldn't help but love the idea! 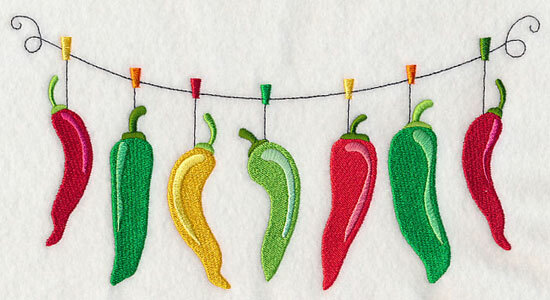 Here, a line of sizzling, spicy peppers is ready to be stitched on your next embroidery project. 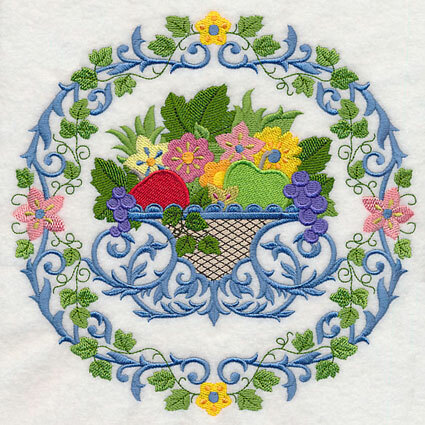 9.39" x 4.90" and 7.80" x 4.07" and 6.85" x 3.58"
Fresh green veggies and the ingredients to make homemade salsa are also terrific additions to embroidery projects. Add them to aprons, tea towels, apparel, and more! 9.39" x 4.68" and 7.80" x 3.88" and 6.85" x 3.41"
The ingredients for a batch of delicious fruit salad hang on this sweet clothesline. 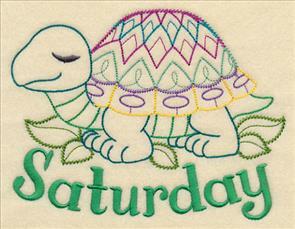 It's a fun addition to shirts, linens, gifts, and more. 9.40" x 4.32" and 7.79" x 3.58" and 6.87" x 3.15"
Stitch a set of tea towels using all the tasty designs, or pick your favorite to highlight singly. 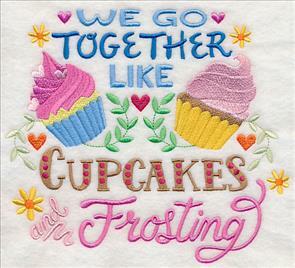 They're all delicious additions to any embroidery project. 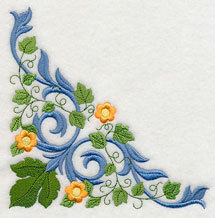 9.40" x 4.62" and 7.80" x 3.84" and 6.85" x 3.37"
Gina was inspired by traditional bone china patterns, and was excited about the possibility of similar-looking embroidery designs. 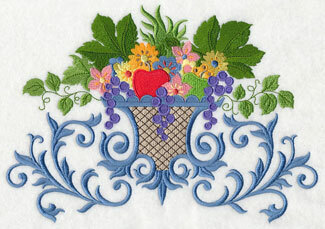 This gorgeous basket overflows with elegance and beauty, and is a stunning addition to pillows, quilts, and more. Great idea, Gina! 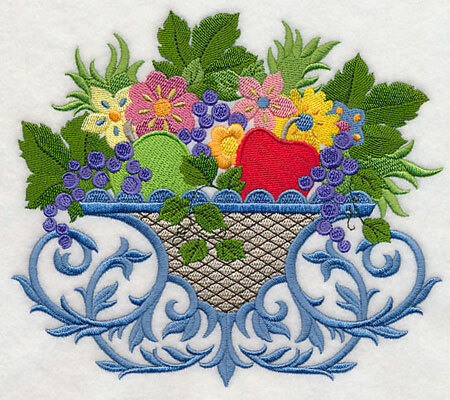 7.98" x 6.89" and 7.33" x 6.34" and 6.72" x 5.81" and 5.60" x 4.84"
Each basket is filled to the brim with greenery, flowers, and fruit, and are an eye-catching addition to embroidery projects. 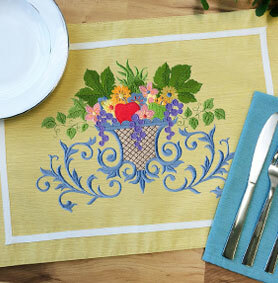 They're gorgeous on placemats, table runners, tablecloths, bed linens, towels, and more. 9.82" x 6.89" and 8.36" x 5.86"
7.57" x 5.31" and 6.86" x 4.81"
An intricate wreath encircles a bountiful basket in this sophisticated design. Stitch alongside the two baskets for a trio of coordinating projects, or highlight on its own. 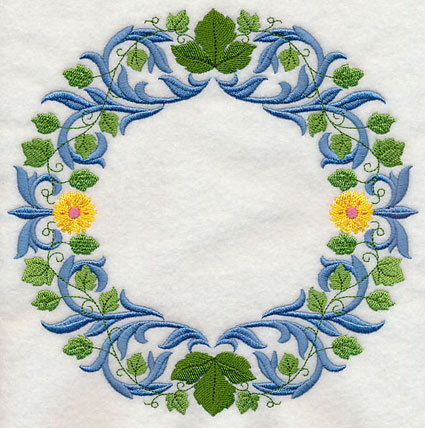 7.80" x 7.74" and 6.94" x 6.88" and 5.88" x 5.83" and 4.85" x 4.82"
A simpler wreath is no less striking when stitched on pillows, quilts, and more. 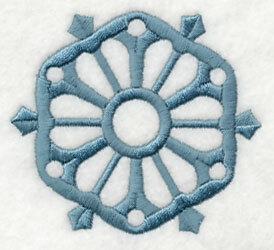 We love the idea of adding monograms inside the wreath, pairing it with similar designs, or stitching it alone. 7.78" x 7.68" and 6.98" x 6.90" and 5.91" x 5.82" and 4.88" x 4.82"
A blooming border is the perfect complement to the wreath and basket designs above. 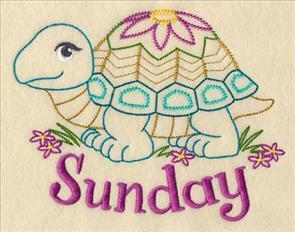 Repeat it along table and bed linens, or as the border to a quilt. 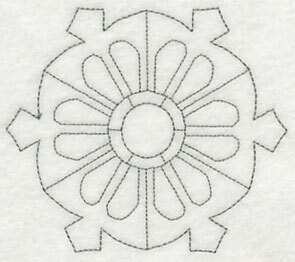 Click here to learn more about repeating designs, or watch our video! 11.71" x 5.48" and 9.39" x 4.40" and 7.80" x 3.65" and 6.01" x 2.82"
A tasteful and stylish corner and border finish this set of chic designs. 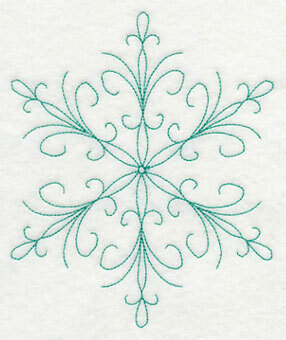 Stitch all the designs on one project, like a linen set or quilt! 5.84" x 5.84" and 4.83" x 4.83"
11.70" x 2.99" and 9.39" x 2.40"
7.80" x 2.00" and 5.98" x 1.53"
Stitch these classic, eye-catching designs on quilts, pillows, and more. Order the designs individually by clicking the links above, or get the design pack. 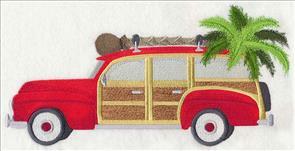 Mickey liked the current design featuring a wood-paneled wagon bringing home a Christmas tree, and was inspired to think of a few warmer-weather versions. 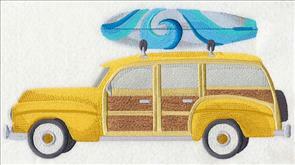 Here, a palm tree and a surfboard catch a ride with these wood-paneled cars. 11.00" x 5.54" and 9.42" x 4.74"
10.99" x 5.83" and 9.40" x 4.98"
7.80" x 4.14" and 6.87" x 3.65"
The Sanibel Island lighthouse is the first light in Florida's Gulf, and is easily recognized by the 98-foot tall skeleton tower. 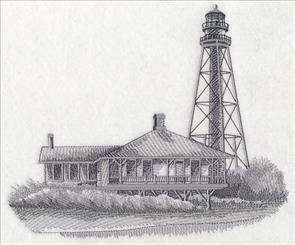 It was first lit on August 20, 1884, and has a central spiral staircase that starts 10 feet above ground. 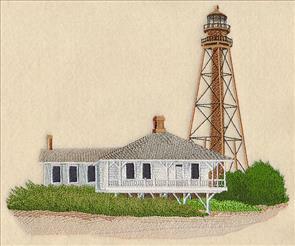 Both Sheryl and Sandee requested the majestic building, and we were excited to add it to our growing collection of lighthouse designs. 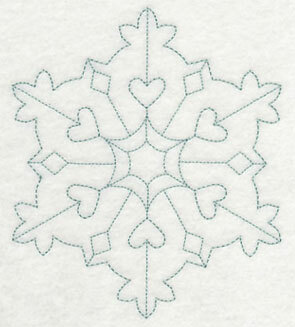 8.24" x 6.89" and 6.98" x 5.85" and 5.76" x 4.86"
Kari was using designs from the Snowy Serenade Design Pack on a project, and had the brilliant idea of separating the snowflakes in the designs to be sold separately. Thanks for the terrific suggestion, Kari! 5.76" x 6.85" and 4.81" x 5.72"
4.80" x 5.70" and 3.21" x 3.81"
2.17" x 2.58" and 1.42" x 1.69"
Each of the original designs featured several snowflakes in one motif. 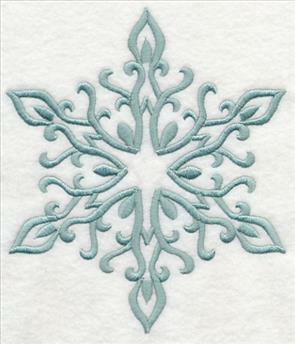 Here, the snowflakes are available for individual purchase -- stitch as a fabulous complement to the Snowy Serenade designs! 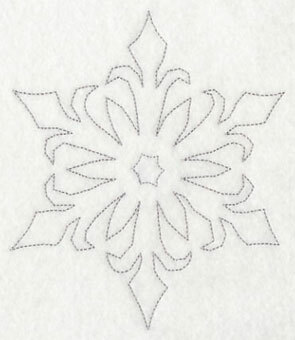 5.82" x 6.72" and 4.82" x 5.56"
4.80" x 5.63" and 3.24" x 3.80"
1.67" x 1.96" and 1.10" x 1.29"
Both stitch-filled snowflakes and accompanying vintage-style snowflake are ready to adorn your next embroidery project. Stitch them together, or use your favorite alone! 5.80" x 6.62" and 4.80" x 5.48"
4.80" x 5.52" and 3.37" x 3.88"
2.67" x 3.07" and 1.68" x 1.93"
These snowflakes are terrific additions to cozy garments and home decor. Use them to warm up sweatshirts, fleece ponchos, scarves, hats, and more. 5.31" x 4.66" and 4.51" x 3.96"
3.51" x 3.13" and 2.61" x 2.27"
1.81" x 1.59" and 0.95" x 0.84"
We also love the idea of featuring all the snowflakes together on one project, like a quilt or wall hanging. They're fabulous for decorating for winter! 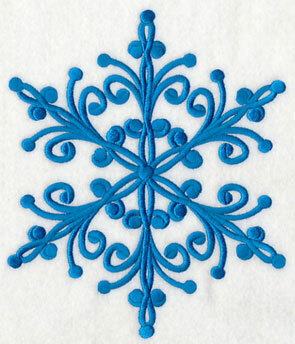 4.85" x 5.58" and 3.35" x 3.85"
4.50" x 3.91" and 3.50" x 3.03"
2.62" x 2.26" and 1.60" x 1.38"
Get these "cool" snowflakes for your next wintery project! Order the designs individually by clicking the links above, or get the design pack. 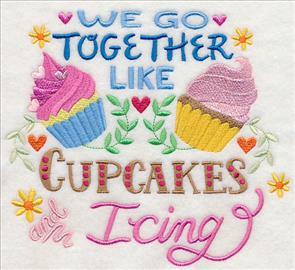 Marsha couldn't get enough of the We Go Together designs, and thought a "We Go Together Like Cupcakes and Frosting" version would be fabulous. A second version featuring icing in place of frosting is just as sweet. 7.69" x 6.85" and 6.58" x 5.86"
5.45" x 4.85" and 3.87" x 3.45"